Today wasn't my PR day, but that's ok. I went in feeling confident, thinking it should be a no problem PR after all of the track work I've been doing. I started out faster than I normally would around a 9:25 pace, thinking I could hold close or drop off only slightly because I'm usually a negative-split half marathoner. Oops, wrong. I'm not sure if I went out too fast (target average pace was 9:40) or if it was 70 degree temps, but my old friend the side cramp came out around mile 2.5 and hasn't let me go yet. And yes, I mean I still have it as I write this post at 9 pm. I'm getting much better at running with the cramp, which is good I think, but at some point it just gets to me and really hurts. It hurts more when going downhill, so even the little downhill inclines near the end of the half were torture. I held my target PR pace until about mile 8, but after that I began to slip quickly. By mile 11 I wasn't sure I could manage to run to 13, and I ended up with some walk/run for the last couple of miles. I crossed the finish at 2:14:24, about 7 minutes slower than my current PR. I really wish I could get to the bottom of the cramping issue. 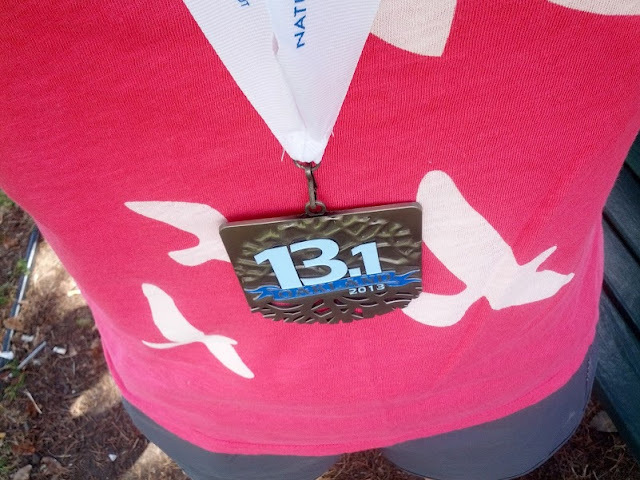 My pattern in the last year is no cramp = PR or close, cramp = 7+ minutes slower than PR. Talk about frustrating. Even though the side cramp played a role in the slow down, I also learned today that longer tempo runs are a must. I've been doing the track interval work, but that isn't yet getting me to the distances I need. I likely also need more mental stamina to hold onto faster paces, although at least I'm good at pushing (albeit very slowly) through pain. On the bright side, I was able to see quite a few friends at the race and the weather was gorgeous. I really enjoy the course, especially the Crucible fire arch and this iron horse that breathes fire. There are many cheer stations with music, a highlight being the Oakland Raiders group who dress up and get super excited. Aside from the not so ideal race performance, it was a fun day. 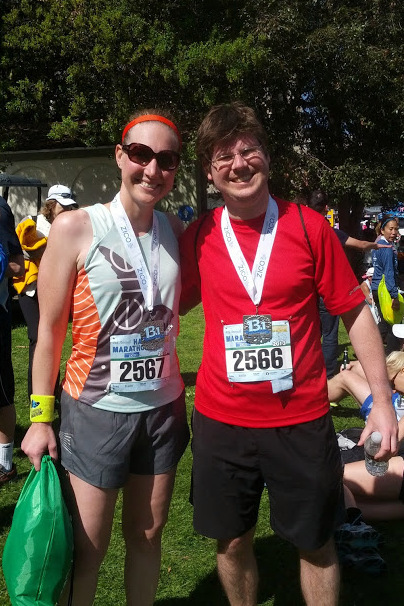 Post-race with Natalie, so much fun to see her this weekend! The race overall is a great event. I especially like the later 9:15 am start time, which enables everyone to take BART to a block away from the start line. Having no parking or driving hassle is amazing. The staging area is in Snow Park, which has plenty of space for the race festivities and for people to lounge on the grass after it's over. The course runs through downtown Oakland and people are pretty into it; there are lots of people out cheering along the way. 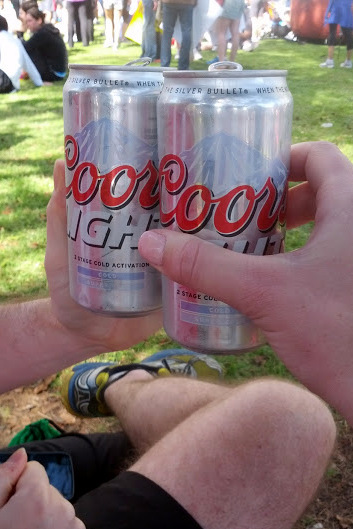 At the end, they give you not one but TWO two beer tickets, which are redeemed for cans of Coors Light. Not my fave beer, but hey it's a nice gesture and beer in general tastes good after running. And now the race details. The Expo. 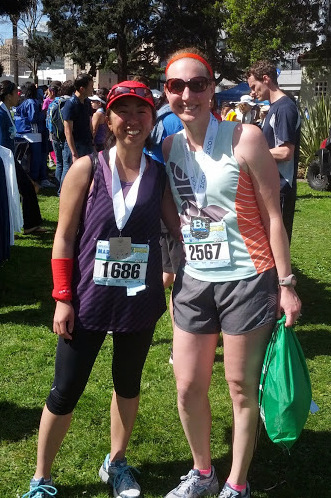 The Oakland Running Festival expo is medium-size, and it's a fun one to walk around to see vendors and other local races. This year they had a booth for Hoka One One shoes, and I couldn't resist trying them on. More on that in a later post! We didn't have any lines for picking up race goods, and it wasn't too crowded when we went around 1 pm. I really like the shirt design this year, although I wasn't a fan of last year's design. Shirts were long sleeve and men/women specific. Dark blue with fun blue and white design. The Course. This one is basically flat, with perhaps a few easy inclines or declines for an underpass and around Lake Merritt. Really though, I don't think these are considered real 'hills.' 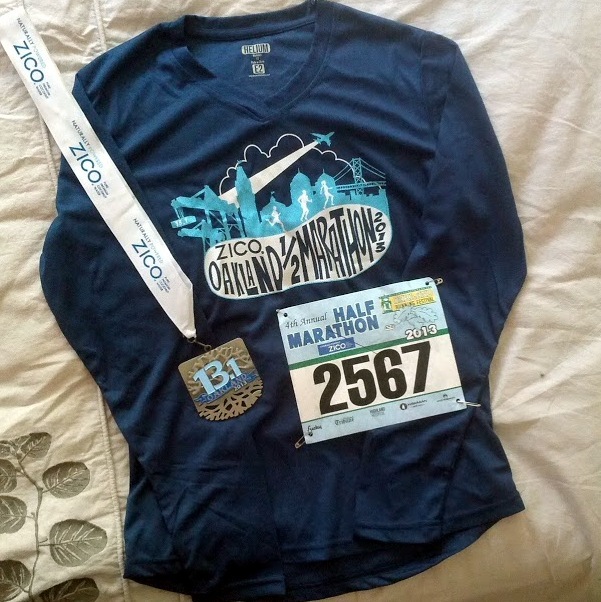 I found it to be a pretty easy course in the world of half marathons last year, and I was thankful for that this year when I was hurting. As mentioned above, I like the people out cheering and the little groups with entertainment. The Support. The volunteers did a great job! Gear check was a little confusing because the bib number signs were off, but otherwise nothing to be critical about. 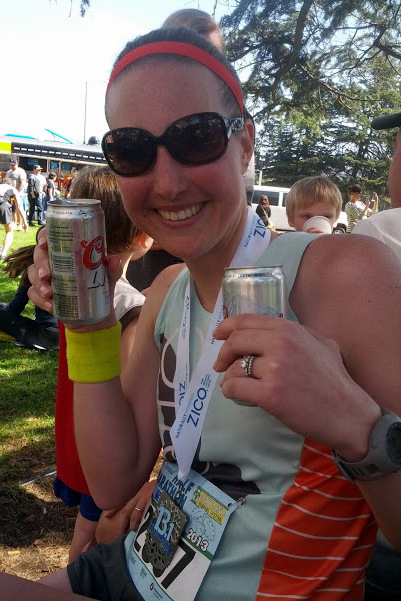 I never had to wait for water at aid stations, and they had plenty of water and gatorade. There was one Gu station on the half course too. There were porta-potties with each aid station, and I'd say the aid stations were about 2-3 miles apart. The Police were out to control traffic and were doing a great job at dealing with annoyed car drivers stopped at the intersections. I wouldn't want that job! 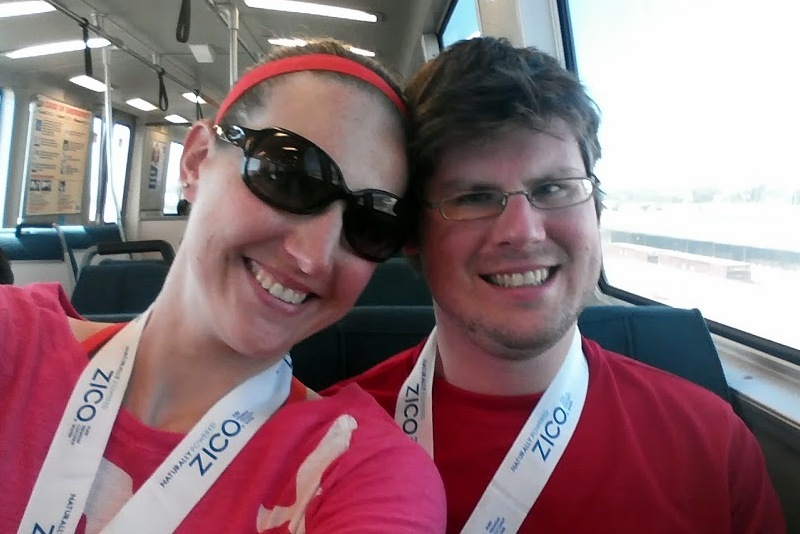 The race ended, we grabbed some pizza at Zachary's with Natalie, and then headed back for our BART ride home. Again, I love the ability to take public transportation to the race. Love it so much I had to take a photo. Not really, I just got bored. Until next time...just keep running! Sorry you had a bad race. I don't know what you've done/said before about your cramp issue, but my guess is that it is a core or hip strength issue as it sounds like it happens when you're fatigued and pushing to go faster. Hope you figure it out soon!! I was just talking to a friend about that, wondering if strength would help! Dr thought it was liver at first but couldn't prove anything via MRI/CT. It only happens off and on, but usually when it does it's warm and/or I'm working harder. I might just be working harder when it's warm. Thank you! Such a bummer about the cramp! I wish I had some suggestions, but all I can think of trying is hydration and electrolyte quantities. Yes! I will start doing the pace runs. Really I will...even though I'm scared of them. Ugh, that terrible cramp! That really stinks. In addition, while coors light is never the top choice post-race, right now, since it has been since before thanksgiving since I have had ANY beer, I would LOVE one! What a bummer that you ended up with a side cramp! Seems like you have a few good ideas of what to try to improve. I hope longer tempo runs and some strengthening work out! At least yesterday was a wonderful day to race. I thought it was very well run too. And I loved the crowd support--probably one of the best I've been in for that. I think I have an idea, I'll get there I hope. It definitely was a GREAT day! Sorry about the side cramp :( I get them too off an on. It drives me nuts. I've heard strengthening the core helps and just staying hydrated. When I was doing a lot of yoga and running, I noticed the cramp was virtually non existant. Now that I kinda sorta stopped my everyday yoga, I do feel a wee bit of a strain in my right side when I run at times. Not always, but it pops up. Thanks Sonia! I like the core strength suggestions, I'm going to work on that. Appreciate the suggestions a ton! During the warm months I had a similar problem, side cramp that would last long after I finished running. I've read various suggestions (small amount of mylanta, packet of mustard). But I never think to plan that before I leave, because I can't predict when it will come on. I hope you're able to find an answer! If it only happens when the weather is warmer, I wonder if it has something to do with electrolytes?? No idea. Hope you can figure it out soon. Looks like a great event, I love the medal! Maybe electrolytes? I'm still working on it! :) Thanks Heather! Bummer about the cramping (they plagued me at LA too! boo!) but sounds like you still had a lot of fun. I agree this is a great race and I would love to run it again. Sounds like implementing some longer tempo runs is a good idea (but don't go too long, I hear 45-1 hour is the range you want to stay within). You'll get that PR! I know it!!! Congrats Paulette! I absolutely love the shirt they gave you - super cute! I love you wore your medal on the BART! Great recap and it looks like you had a great time which is what counts! Hey that is a great half, I want to do it or the full there next year! 70F is HOT. Any temps over 60F are going to slow you down unless your body really likes the heat and does it often. And if it's bright sun..that's like another 10F over ambient. The next time you have a cramp, when it is still sore, I would get right way to a masseuse or PT person and have then hunt around to make sure you don't have a particular core muscle (like the Psoas for example) that is in spasm. Re: readers. Feedly is working well for me now. I figured out how to get the reader -style view after getting a nice mass emailing from the CEO. I think a lot of folks had the same complaint. You should! I really like the race. Just FYI, the marathon starts earlier. Cramps are the worst! I don't get them much, but when I do, it's disturbing. I hope yours go away soon! The medal is super pretty! Yes - I never got them until last year at RnR Seattle for the marathon, and it happened in mile 1. So weird! I feel your pain with the side cramp issues! I struggled with the same problem last year and found the only thing that really helped me is focusing on and controlling my breathing when I feel one coming on - both inhales and exhales. I've also tried pushing a few fingers into the cramp to try and massage it out, but as a warning, this can lead to bruising if you get carried away! Thanks Sun! I've been working on the breathing, I think you are right it can help. I didn't try massaging it during the race but that's a good idea too.